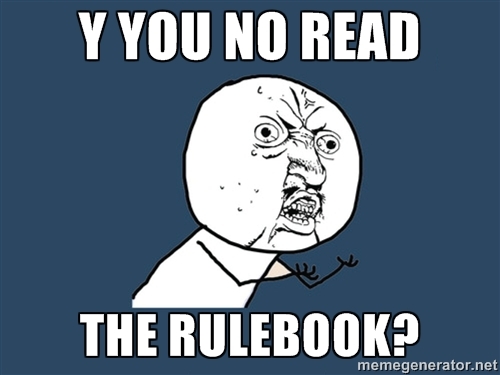 #TruthBomb: It’s Not the Rulebook. It’s You. I read a lot of rulebooks. A lot, a lot, a lot of rulebooks. I read rulebooks from established publishers, rulebooks from rookie publishers, rulebooks from that guy who’s trying to fund his first effort on Kickstarter. One of my friends told my wife, “I have outsourced all of my rulebook reading to Lenny” just because I read and teach rules so much. I read a lot of rulebooks. And as I’ve commented, some of them are pretty terrible. But today, I don’t want to talk about those terrible rulebooks. I want to talk about you. You might want to brace yourself for a hard truth. You see, while designers and publishers (obviously) bear much of the responsibility for making sure their games are played appropriately, they are not solely responsible. You, as a player, have to put in the effort to understand them. Watching or reading an overview of the rules on a review. Flipping distractedly through the rulebook while the TV is on. Reading through the rulebook once. Yes, that’s right. I contend that you have not adequately put in the effort to understand the rules to a game if you have read the rulebook only once. You can argue that “Well, the designer should have made it clear on the first go through” all you want–the fact of the matter is that when we want to understand something we read, we hardly give it a single pass. And when the something we want to understand is a somewhat complex system of interlocking pieces known as a game, why should we expect to understand everything the first time we read it? Depending on the game, it’s often hard to grasp the entire system the first time playing it, let alone reading about it. The rules threads on BGG are overburdened with questions that even a cursory reading of the rules would put beyond the shadow of doubt. Most questions could be answered if players would follow one simple rule: Consult. The. Rulebook. More than once. Familiarize yourself with it. Do you understand the game now? Good. Do you not? Read it again. Chances are, most of your misunderstandings will melt away. Nobody is perfect. I’ve had my share of rules missteps, both reading and teaching, but usually, the failure is mine. After playing and something doesn’t work, I read the rulebook again, and I recognize something I missed. 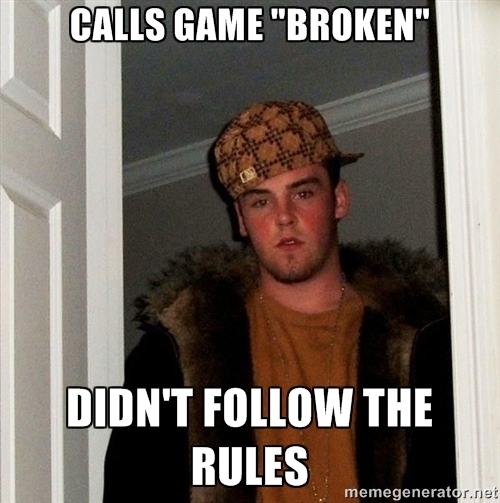 But that’s the thing: the fault is often mine, not the rulebook’s. I think there is a tendency to assume that if there’s an error somewhere, it must be someone else’s fault. “The rules aren’t clear here!” But the first, easiest, and often most expedient place to look for errors is right in the mirror. I think we could all benefit by extending charity to others (even designers and publishers–they might know what they’re doing!) and by regarding ourselves with a healthy dose of self-doubt. As I said at the beginning, I understand that rulebooks are sometimes terrible. There are legitimate instances when rulebooks are inadequate–when they are missing rules, or what rules are there are ambiguous, or the rules are downright impossible to untangle. And the burden is on designers and publishers to present their rules in clear, unambiguous, and digestible fashion. But those facts do not absolve you, the player, from doing your part to understand them. The first place to look for a rules solution is not the forums or a private message to the designer. The first place to look is in the rulebook. Even if it’s the second, third, or fourth time reading it. What do you think? Am I being too harsh? I’d love to hear your perspective in the comments. * If you simply can’t endure reading the rulebook, there are often good full explanation videos available online. These are usually not reviews. One good source is Watch It Played. Obviously, one of the areas in gaming which has been evident of late is the significant number of foreign designers, for which their rules require painstaking translation. I know a thing or two about translation as someone who has managed linguists in the Air Force and the FBI. It’s not easy, and translations are not always agreed upon by other linguists. To this I say, read more than the printed word. As a rule of thumb, board gamers skew to the right on the intelligence bell curve. Thus, use intuition at times to assist you. Like the author, I’ve read a ton of rules, from carefully crafted tomes which accompany most war games to 2-page rules for a simple card game. I too, am surprised by the inquiries clogging BGG threads…please read! Agreed! But, there is more to the issue. Some players don’t learn as well by reading, they prefer a demonstration. This relies on a teacher, presumably someone who has read the rules already. That teacher may be a good one or may not. And game designers don’t have any control over that. Another problem I see more and more are rules written on some type of card or play aid. In these games, the rulebook lays out some basic concepts, but the details of specific actions are written on a card that gets played during the course of the game. Some players never see the rule until the card is played, usually against them by an opportunistic opponent. Errata is another problem. It’s not enough to read the rule book, you have to be current on the evolving changes to the rules that are usually found online at the game designer’s website or on forums. I totally agree with you on this topic. I also find it very amusing when presenting people with a new game, and because they have played a lot of similar games, they start to put all kind of “other” rules into this game, usually because “you can do it in the other games, and the rules doesn’t say you can’t”. I think a good majority of gamers would agree with you, it’s why many of us take it easy on our first play through of a game. There are a few gaming extremist who are unsettling but generally speaking if you are the “rules reader” you understand the responsibility lies with you even with a bad rule book. Good topic and well written, you make a valid point while keeping the subject entertaining.